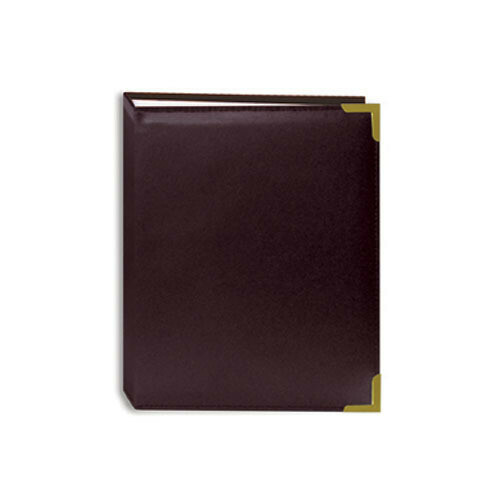 Store, protect and display one hundred 4x6" photos with the attractive, burgundy E4-100 Brass Corner Photo Album from Pioneer. This archival, acid-free, photo-safe album is constructed from sewn leatherette with brass corner accents. Photos load from the top, one-per-page, into clear plastic pockets with a white mesh background. E4-100 Brass Corner Photo Album (Burgundy) is rated 5.0 out of 5 by 4. Rated 5 out of 5 by Crafty Granny from Great little album! I needed a couple of nice little 4 x 6 picture albums that hold 100 photos. These are VERY nice. I was so pleased with the quality, I may order several more! Rated 5 out of 5 by Astromama from Just what I was looking for I had no idea it would be so hard to find an album to hold 100 photos. I was happy to find one on the B&H website. The album is perfect for what I wanted. Rated 5 out of 5 by Terresa from Exactly what I needed Was looking for small albums to give to grandparents and this album fit the bill.